While living in Switzerland, I noticed that many people used nordic poles to walk vigorously. Their posture was excellent and yet their movements seemed so fluid, fast and effortless. More popular in Europe than the US, nordic walking is a sport that has yet to be recognized or “gone viral” as my daughter would say. She calls nordic walking an “old ladies sport” but there couldn’t be anything further from the truth. Nordic walking is fitness walking with specially designed poles, similar to ski poles that provide stability to the walker. Force is applied to the poles with each stride. Back, hip, knee, and foot stress is minimized or eliminated with nordic walking because the poles give a full body workout by distributing the exertion whereas normal walking puts the impact on the joints of the legs and feet.When people are young, they often don’t worry about the stress placed on the joints but as we age, our bodies are more prone to injury and yet there is no more important time to keep moving, maintaining or building muscle, and building cardiovascular strength. Over the age of 40, most people find they can’t run as fast as they used to or play tennis as vigorously. Instead of stopping or injuring ourselves, we need to think about alternative ways to keep moving and nordic walking is an option that should be considered because the sport can be mastered quickly and done year-round by yourself or with other people. There were many days in Switzerland when the sun would be shining gloriously and I couldn’t help but go out for a 10 mile nordic walk. 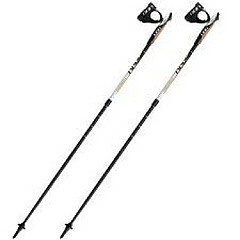 The right length poles (which are significantly shorter than ski poles) are essential. Walkers of the same height may not use the same length pole because torso and hip lengths vary. However, to estimate the length needed, apply the following formula: Height in Inches x 2.54 = Height in Centimeters x .685 = Pole Length in Centimeters. For example, 69 inches x 2.54 = 175 centimeters x .685 = 120 centimeter poles. Pole lengths come in youth sizes (80 – 110 centimeters) for those 46 inches – 63 inches tall and adult sizes (100 – 130 centimeters) for those 58 inches – 75 inches tall. Poles can be a fixed length or adjustable (which are good for travel but fixed length poles are better for everyday use). Nordic walking poles are lightweight and normally made of aluminum, carbon fiber, or composite materials. Consider buying the lightest pole available for ease of use. Nordic walking poles have hardened metal tips with removable slanted rubber tips. 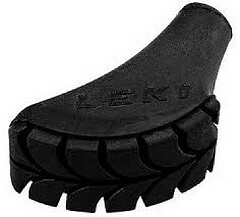 The hardened tips are for walking on soft surfaces and the slanted rubber tips are used on hard surfaces. The slanted rubber tips allow for push-off. Buy extra tips as they wear out with use. Nordic Walking Poles come with a fingerless glove strip grip with loop straps. The straps allow for the release of the hand from the pole at the end of your stride keeping your hand in place to grasp the pole on the way back to the front of the stride. Don’t confuse nordic poles with trek poles; trek poles cannot be used for nordic walking. Nordic walking combines simplicity with conditioning while minimizing stress on the back, legs, knees, and feet. But, most of all nordic walking is fun especially on a sunny day when the trails beckon.